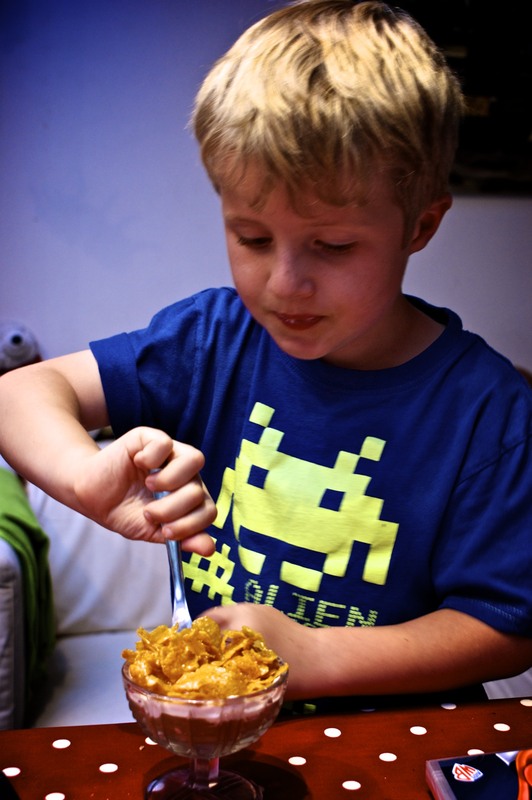 Last month I wrote an article for Lovefood.com about surprising uses for everyday ingredients – which included a lovely dessert my mum makes using cornflakes. It’s a summery take on a fruit crumble, and I’ve since been asked to share the recipe. No one really feels like eating crumble in the summer, so this is perfect for using up the glut of apples, blackberries or even plums. Whatever you fancy really. I used to hate eating stewed fruit as a child, but if mum put cream and this divine crunchy and sweet cornflake topping on then i’d happily clear my bowl. So now I’ve tried the same approach on my own children to see what they make of it. The recipe is adapted from one of my mum’s old Good Housekeeping books. The amount of apple I include below is far more than you need for this dessert alone, so you can either make less or freeze the leftovers. The topping is enough to feed four generously and you can decide how much yoghurt you use. I’ve opted to use greek yoghurt as it’s super creamy but fresher tasting than cream or the evaporated milk from the 1960’s recipe. You could always use cold custard as I’m sure that would be really yummy too. 1. Put the apple chunks into a large saucepan, splash in a bit of cold water, scatter with the sugar and cinnamon. Place over a low heat and gently cook until mushed down – stirring occasionally. Leave to cool. 2. 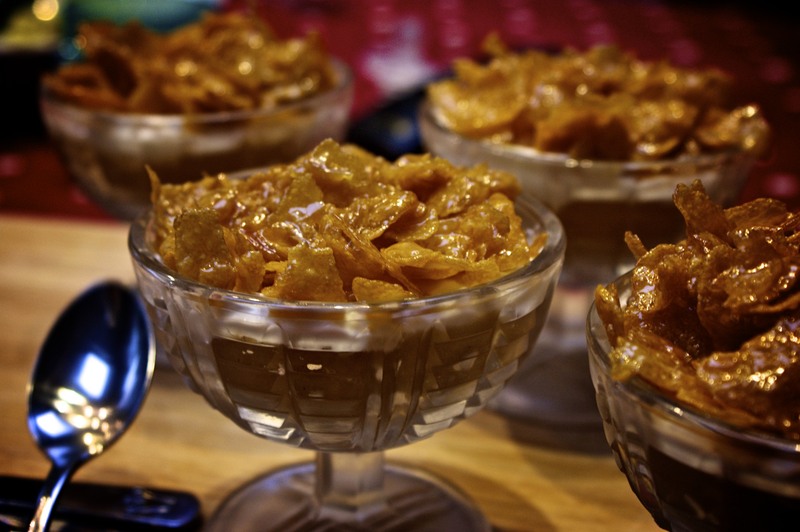 Make the crunchy topping by melting the butter and syrup in a pan, then stir in the cornflakes until well coated. 3. You can either use one big bowl or several dessert glasses here. Put an even layer of the cooked apple at the bottom, then a layer of the yoghurt, then scatter with the crunchy topping. Chill in the fridge before serving. Sam really enjoyed this dessert, his only quibble was that if I made it again could I put some jam in it. Random! We used to have a pudding at school called apricot crackle, with this cornflake topping and apricots (no surprise there!). Really delicious even, with tinned apricots. Ooooh yum!!!! The old school puddings are the best! Does it freeze with the cornflake topping please? Hi Angy. I would only freeze the apple bit of this recipe – don’t think the rest would freeze very well!